Have a Good Shabbos ! If you would like to volunteer to help with checking please use the contact form tab at top of this page. Thank you for being part of our community! ​ After many years of hard work and much sacrifice, we have merited to complete, with Hashem's help, what is to our knowledge, the largest Eruv in all of Chicagoland. 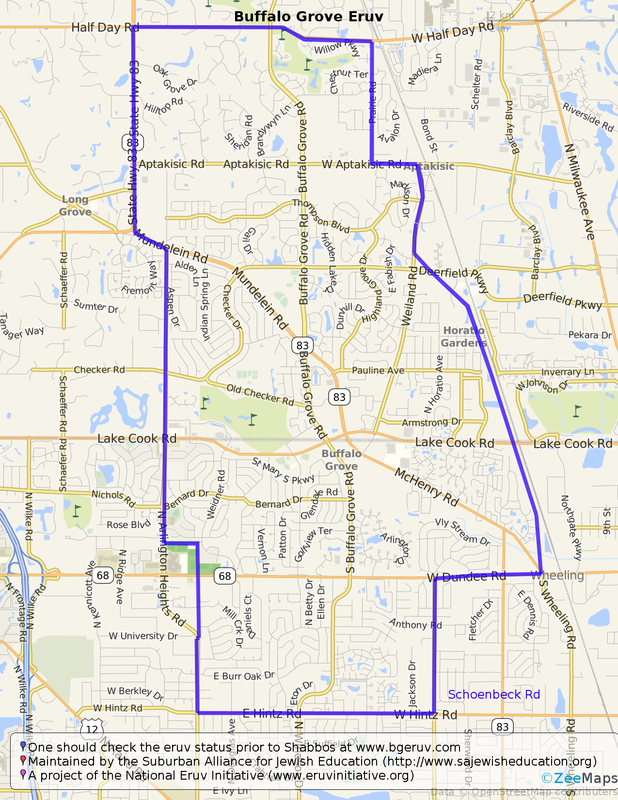 Over 15 miles in length, the Eruv perimeter includes several hundred poles and many stretches of fences. 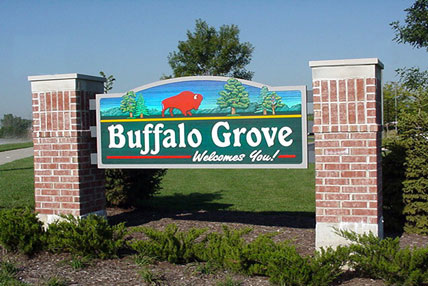 It encompasses the vast majority of Buffalo Grove, parts of Long Grove, Arlington Heights and Wheeling, and includes several large areas of Prairie View. Built in consultation with rabbinic experts, it adheres to very high standards of Jewish Law. Warning - the Eruv is still not usable each week until it has been inspected and certified as operational each week. Please check this webpage on Friday afternoon after 4 pm for weekly updates. With the completion of the Eruv we must also recognize Rabbi Micha Shotkin for getting the renewal project started, by flying out from New Jersey (together with his son) and working several days on the Eruv while training Rabbi Paretzky as well. Our thanks to the National Eruv Initiative, and its founders, Rabbi Baruch Gore and Rabbi Mordechai Paretzky, for providing logistical and planning support to this project, and much of the content on the "What's an Eruv?" page. Buffalo Grove is a growing Jewish community, featuring dynamic rabbinic leadership, Torah classes, shuls with 3 minyanim a day, the Torah Academy day school, a recently completed, beautifully designed and decorated mikvah, kosher food shopping including a CRC certified kosher bakery-- and now, an eruv built to the highest standards! Come visit for a Shabbos and see why Buffalo Grove has been listed repeatedly by Money magazine as one of America's 50 best places to live. Thanks to our volunteers and our sponsoring organization! We would also like to thank our sponsoring organization, the Suburban Alliance for Jewish Education (SAJE), headed by Rabbi Shimon Zehnwirth, which has spearheaded the Eruv project from its inception. From planning the Eruv route and meeting with government and utility officials, to purchasing and refurbishing our bucket truck (we are the only local Eruv that owns one!) to fundraising and recruitment for volunteers, SAJE has taken responsibility to make the BG Eruv dream a reality. 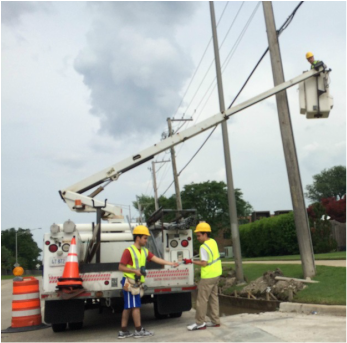 Alongside its other projects, the Torah Academy day school, JFIX Hebrew School, and the new Buffalo Grove Mikvah, the Eruv project is a critical element in growing and expanding the Jewish community and enhancing Jewish life.